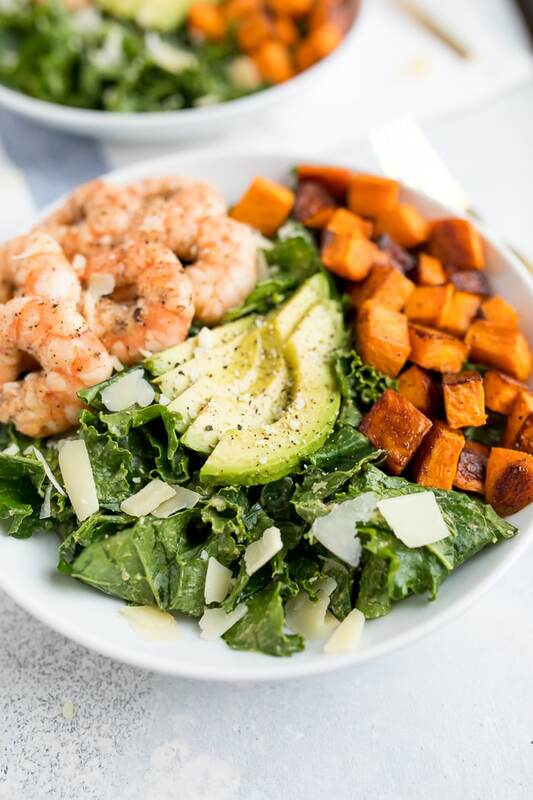 A healthy kale caesar salad with grilled lemon pepper shrimp, sweet potato croutons, avocado, parmesan cheese and a creamy avocado caesar dressing. Have you tried my new avocado caesar dressing yet? I have to say, it’s delicious on a traditional caesar salad and also over this kale caesar salad with grilled shrimp! 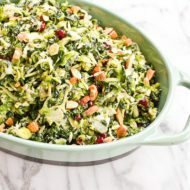 Kale – A powerhouse green. It’s anti-inflammatory, which everyone could use more of if you ask me! It’s also an antioxidant so it helps detox your body, and is high in a lot of great vitamins and minerals your body needs to function at its best. If you’re not a kale fan, don’t sweat! Swap it out for the greens of your choice… I promise the salad will still be delicious! 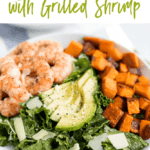 Grilled lemon pepper shrimp – I personally love shrimp or chicken on my caesar salads, but feel free to use your own personal favorite protein (animal or plant-based). 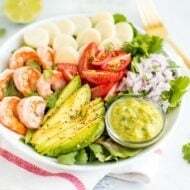 Just make sure you don’t skimp on the protein in this salad – the magic combination to getting and staying full is healthy carbs, healthy fat, and lean protein. I also have to mention, the lemon pepper flavoring on this shrimp complement the dressing perfectly! 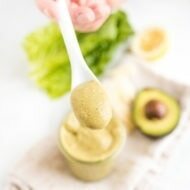 Avocado caesar dressing – Magical, delicious and healthy. What more could you want? This dressing takes approximately 15 seconds to make (and very few dishes), so don’t let lack of time keep you from making it from scratch! It can even be made ahead of time (you’re welcome, meal preppers!). Avocado – when in doubt, put an avocado on it. The dressing recipe only calls for 1/3 of an avocado, so unless you already ate it, you’ve got 2/3 of an avocado left to top your salad with! The healthy fats will help you feel full and stay satisfied for longer (which in my opinion is super important when eating salads). What’s your favorite salad to order when you go out to eat? Are you a caesar salad lover? 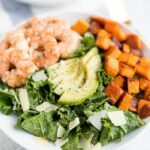 A healthy kale caesar salad with grilled shrimp, sweet potato croutons, avocado, parmesan cheese and a creamy avocado caesar dressing. 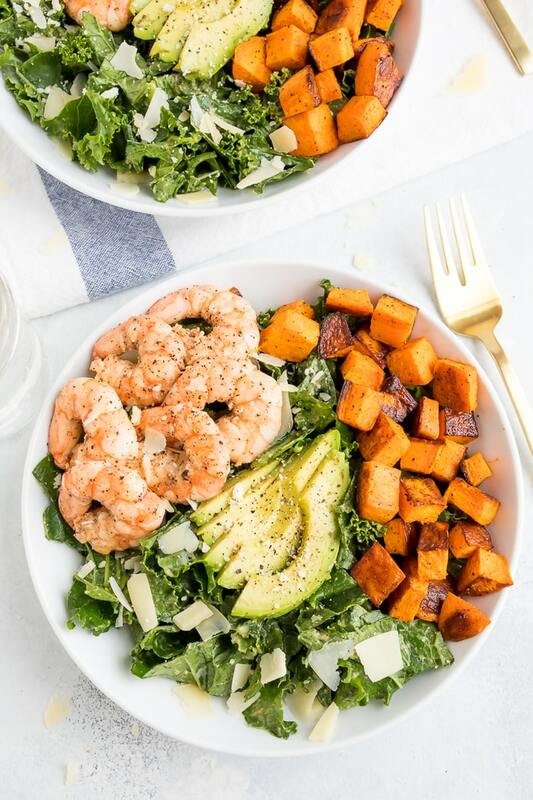 Roast your sweet potato croutons and grill the lemon pepper shrimp. Add chopped kale to a big bowl. Drizzle ½ of the avocado caesar dressing over kale and toss. Taste and add more dressing, if desired (I like the kale well-coated so I use the whole batch of dressing). 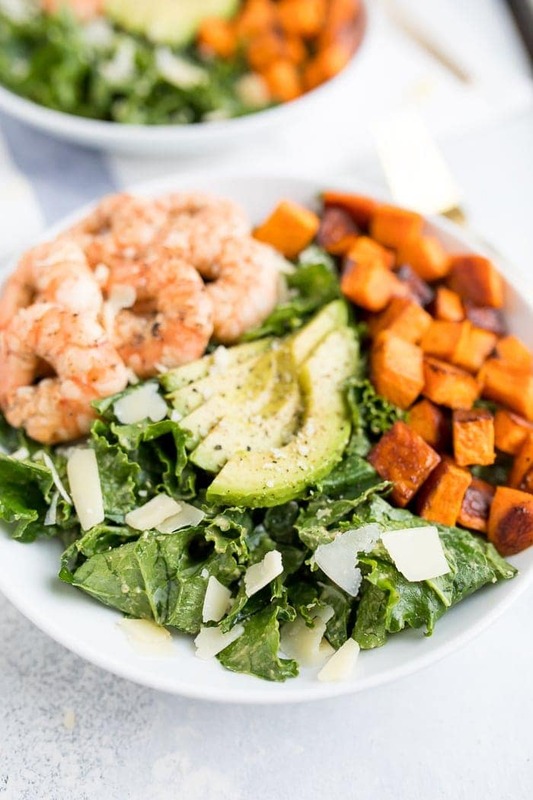 To serve, add dressed kale into serving bowls and top with sweet potato croutons, grilled shrimp and avocado slices. If you try this healthy kale caesar salad please leave a comment and star rating below. Your feedback makes my day and helps other EBF readers who are planning to try the recipe. It’s hard to find the actual prep directions for the lemon shrimp?